My new book Funny Awards Certificates: 101 Humorous Awards to Give Family, Friends, and Coworkers (1st Edition) is now on sale! This collection is a little different from past award collections. I originally wrote "Funny Employee Awards" to give managers and bosses a way to have fun with employees, volunteers or staff without offending or getting into trouble with Human Resources. 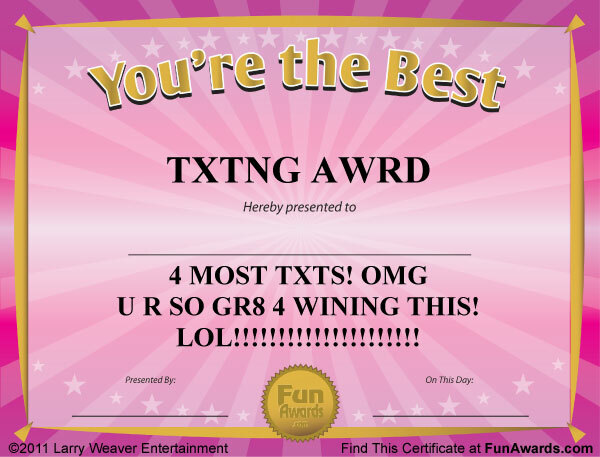 "Funny Award Certificates" is a more peer-to-peer product. As the title states, I designed these awards for you to give to family, friends, coworkers - and even teammates. New to this edition is the ability to edit both the Award Title and the Award Description. If this functionality proves popular, I will incorporate it into future versions of "Funny Employee Awards". Be sure to let me know your thoughts in the comments section. "Does the thought of holiday parties evoke images of awkward conversations around the family dinner table or never-ending White Elephant gift swaps? Comedian Larry Weaver feels your pain." I hope this book will help you liven up your family reunions, alumni gatherings, neighborhood parties, and office events!